Q. David. Let's talk about Bicycling Science, and the first edition ever. I'm curious what really got that whole project started. What motivated you to put together a compendium of knowledge such as this? Q. ....Why did you choose to put your money here as opposed to something else? Did you feel that the bicycle could be improved upon? Was there a deficiency or deficiencies you believed could take some addressing? DGW : Sure. When I first came here, I observed that strangely there weren't many avid cyclists around. Growing up in England, I know a lot of people rode back home but it wasn't obviously happening here. Bicycles weren't too safe either and I saw a number of people involved in injuries and nasty crashes due to discomfort, faulty equipment and so on. Bicycles were expensive and required a good deal of energy to propel. I had a strong feeling that there was room for new improvements in this area for human powered land transport....as an example, why not consider one which had a better riding position? 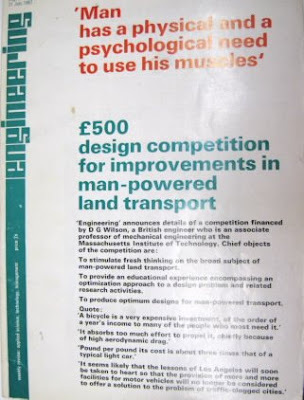 And so I proposed this competition and with a little help from a publication at the time known as Engineering, I was able to receive a great deal of publicity for it for over two years. The competition details from a page in Engineering. Borrowed with permission from David Wilson's upcoming Memoirs, Chapter 10. Q. So Frank Whitt sent you a possible design as an entry to this competition? DGW : Well, yes he did. Unfortunately, he didn't win. In fact, after the winners were announced in April or something like that of 1969, I received a letter from him showing an interest in actually getting to meet me and discuss bicycle designs. He said he had some ideas and I said, sure...I like the plan. So the next time I went to London, I had a meeting with him over a meal in this most fascinating place, his 'London club'. We had an interesting discussion of bicycles in one fine restaurant in this crusty establishment.It was later, as I remember it, we were at this station waiting for my train back to the airport when he handed me some dog eared sheets of paper in an old envelope that he had written on the topic of bicycle motion. He thrust it into my hand and requested my help getting them published in the U.S, alluding to the fact that he was finding it difficult getting his ideas published in non-S.I units in Britain. I don't think he favored the idea of doing otherwise. I said I would try, took the envelope from him and parted ways. His papers interested me quite a bit and I tried to keep my promise when I was back here. Initially, I met with disapproval from many U.S publishers for almost two years. No one really entertained this idea of publishing something on bicycles, leave alone physics and old ideas. It was then that the editor of MIT Press by the name of Frank Satlow (who happened to be a friend), approached me saying he would agree to publish it on the condition that I edit and re-write much of Frank's original papers, and that I include some more up-to-date information for readers. It sounded agreeable to me. After giving it a good look, and much revisions from my side, I had a new book, which I decided to title Bicycling Science : Ergonomics And Mechanics. I had it published by MIT Press soon and I think they made a good lot of money from it thereafter. More than what we expected actually. Q. Why do you think it became so successful? DGW : A number of factors, and luck was certainly one of them. 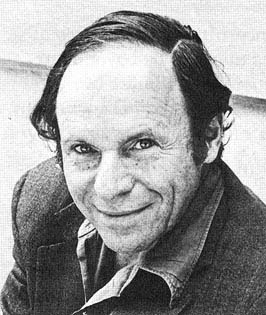 Philip Morrison, the (late) renowned professor of physics at MIT whom I hadn’t met at the time was a prolific book reviewer for Scientific American. He wrote a rather glowing review in that highly regarded journal about the book. That brought it to the attention of at least thirty-five other publications, the book editors of which then felt it necessary to review it. Reviews are very important for books. Even in those days books came pouring out of publishers’ presses, far too many for even a specialized publication to review those just in its own field. The reviews of Bicycling Science were, then, of very great value. The book began to be bought at a far higher rate than The MIT Press (or I) expected. It turned out to be a very nice deal. Q. Most interesting. Let's go back a step here. Who was this Frank Whitt anyway? I mean, what did he do in life? DGW : Well he was an old bachelor living by himself and a good man. He made a living making chemical warfare for the military. He was a chemist I understand, working for the government. Q. Wow. That's a bit odd. Where do warfare and bicycles meet? What's the common thread there? DGW : Yeah, I don't know...I thought it was slightly paradoxical myself, that someone making weapons to kill and destroy would be inclined towards more environmental initiatives such as advocating bikes. Hmmm....(quizzical sound). He had some time for himself to think for sure. Q. Yeah, he must have had some strong connection for bicycling to explore it so seriously. DGW : Oh yes, absolutely. There's no question that he didn't have a passion for bicycles. I don't think he would have imagined writing such a thing otherwise. Q. Did Frank see this work? DGW : He did. The book was quite successful, attaining an almost cult-like status. In the early 90's, we desired for many changes in the original for a second edition, and we needed his help. Unfortunately, by the time Satlow asked us to think about writing the second edition, Frank Whitt was no longer around. He had a massive stroke soon after we began writing the sequel. That sad loss led me to promulgate several myths and inaccuracies in the first chapter on "History" in Bicycle Science II. My beginning intention was in writing history as an interested observer, not as a historian. But that didn't do very well. A group of historians in London rightly pointed out mistakes and wrote me a correction paper to this "history" of mine. It was embarrassing but at the same time, I was very grateful to their effort and wisdom. In fact, when writing the third and final edition to the book, I openly invited their help and contributions in order not to make any additional mistakes that required further revisions. As a token of gratitude for their assistance, I began the first chapter of the book with a piece on genuine history and its purpose as opposed to amateur and fake history. Thank you Ron. Very good writeup. Whitt seems to me as having a certain aura of mystery about him. I'm sure I'd like to read more about into life. Thanks. Glad you're enjoying it. Frank Satlow was my father, and I remembered when he talked about this book at home. He was very happy to have the opportunity to publish it (although he was an editor, not the "chair" of the press). Hey Frank. Pleasure to have you commenting here. I will make the change you suggested. I wasn't really sure what role your dad played with MIT Press. Is he still around? My father passed away about 10 years ago. He was an acquisitions editor - I don't know what he did in particular for this book, but in general he reviewed manuscripts for the Press and worked with authors so that they would publish with the Press. Micheal : Sorry I addressed you by your father's name. It was a typo. I need to type slower.